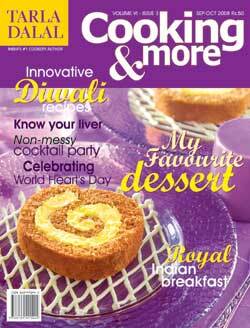 Christmas is here and so are we with a brand new issue of Cooking and More. This issue is special made so that you could host a brunch party for your dear ones. There is lot more interesting in this issue. Create a decorative centerpiece using fresh flowers. There has been an increasing number of kids who are been detected with diabetics. There is an article dedicated specially for the concerned mothers as to what to give their little ones in their tiffin. The well known gourmet chef Mrs. Asha Khatao has given us a few recipes that are very close to her heart. Get to know a little more about those flours that are not very common to all the people. Golgappu - the 5 year old character is sure to arouse your little one’s interest in the book. There are many more articles that are sure to arouse your interest.